An eye-spot (or ocellus) is an eye-like marking on the body of an animal. They are found on butterflies, reptiles, felids, birds and fish. 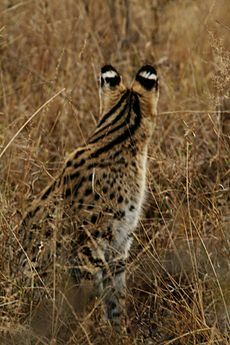 Eye-spots may be a form of mimicry: the spot looks like the eye of a larger animal. Its function may be to draw a predator's attention away from the most vulnerable body parts; or to look like an unpleasant or dangerous animal. In larger animals, eyespots may play a role in intraspecies communication or courtship – the best-known example is probably the eyespots on a peacock's display feathers. There is evidence that eyespots in butterflies are anti-predator defences. Some are deimatic displays to distract, startle or scare off predators, or at least to deflect attacks away from vital body parts. 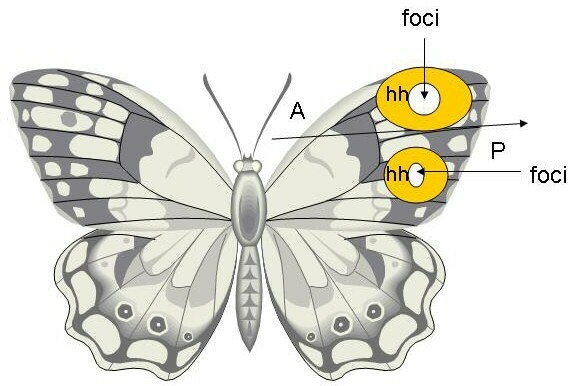 Butterfly eyespots may also play a role in mate recognition and sexual selection, like the eyespots on larger organisms. 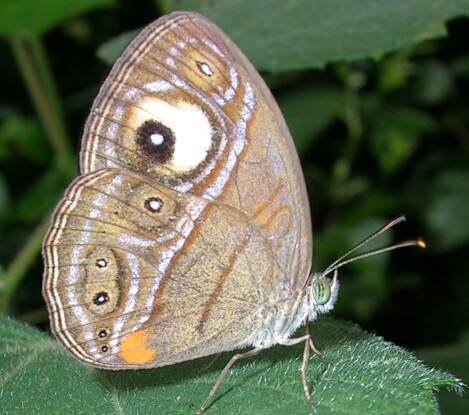 Many butterflies, such as this gladeye bushbrown (Mycalesis patnia), have eyespots on their wings. Eye-spot (mimicry) Facts for Kids. Kiddle Encyclopedia.